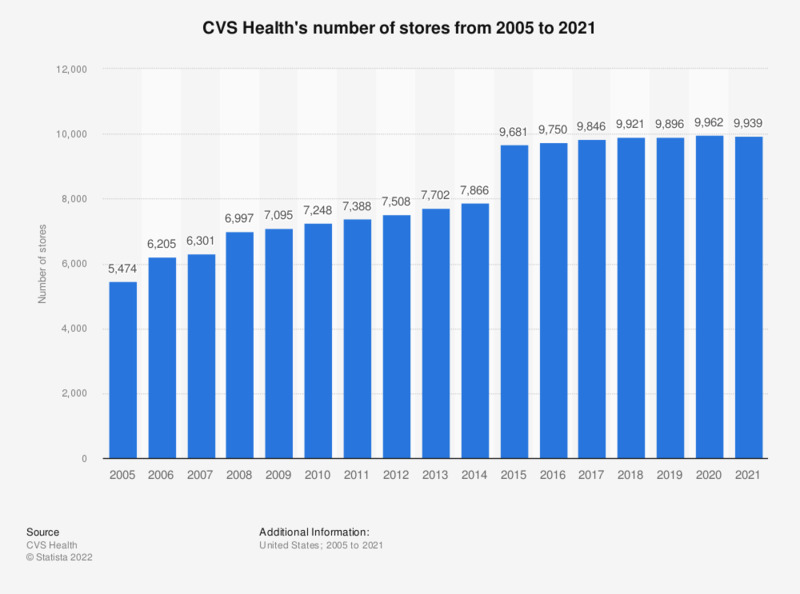 This statistic depicts CVS Health's number of stores from 2005 to 2018. The CVS Health Corporation is a U.S. drug retailing company, with three major segments: Pharmacy Services, Retail/LTC, and Corporate. CVS Health is headquartered in Woonsocket, Rhode Island. In 2018, the company's total number of stores was nearly 10 thousand. In 2014, the company changed its name from CVS Caremark to CVS Health. CVS Health has steadily increased its number of stores in the last decade from 5,474 stores in 2005 to 9,967 stores in 2018. The company’s revenue has also steadily increased from 37 billion U.S. dollars in 2005 to almost 195 billion U.S. dollars in 2018. Around two thirds of the company’s revenue are generated from its pharmacy services while the rest is generated from its retail/LTC segment. The company has three main segments including Pharmacy Services, Retail/LTC, and Corporate. For example, CVS/Caremark is a pharmacy benefit management company, providing services to corporate, insurance, and other health plans. CVS pharmacies are also one of the leading drug store chains in the United States, with its stores located in over 40 states. CVS Health spent 376 million U.S. dollars in advertising in 2014. CVS Health originated when it was first established in 1979 in Irvine, California under the name “Caremark”. Recently, in September 3, 2014, the company changed its corporate name to CVS Health. Once CVS stood for Consumer Value Stores, but former CEO, Thomas Ryan, stated that he believed it now stood for, “Convenience, Value, and Service”. Additionally, the company holds several exclusive private labels at its stores, such as Just the Basics and Earth Essentials. All numbers are as of year-end.